Since the redevelopment of Baltimore's Inner Harbor in the late 1970s, Baltimore has set the standard for urban renewal as one of the oldest seaports, but one of the newest travel destinations welcoming nearly 11 million visitors each year. 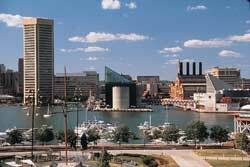 Inner Harbor, now a scenic and popular waterfront area with dozens of retail stores, restaurants and attractions, is enhanced by street entertainers, open-air concerts, fireworks, parades, paddle boats and cruise boats. The Air and Waste Management Association's (AWMA) 95th Annual Conference and Exhibition, cosponsored by the American Institute of Chemical Engineers (AIChE), sets sail in Baltimore on June 23. More than 400 booths at the Baltimore Convention Center will feature companies displaying products and services in areas from alternative transportation to laboratory equipment to waste and hazardous waste equipment and services. The newest addition to the exhibit area includes a Government Pavilion that will host not only U.S. Environmental Protection Agency (EPA) exhibits, but other government agency (e.g., National Park Service and U.S. Department of Energy) exhibits, as well as some trade associations from Washington, D.C.
EPA Administrator Christine Todd Whitman has been invited to make a splash with her keynote address on Monday morning and share her views on how recent events are changing the environmental profession. Technically, there will be nearly 500 paper presentations in 125 sessions. Plenary sessions will be on the environmental and health impacts of emergencies and energy and the environment. The 2002 Critical Review, "Visibility: Science and Regulation" will be authored and presented by Dr. John G. Watson of the Desert Research Institute. Rallying around the theme of AWMA's Annual Conference and Exhibition, "Cooperation for a Better Environment," opportunities for networking include a "Savor the Chesapeake" reception, an Honors and Awards luncheon, and a playful reception called, "Taking the Field for the Environment." In addition, the Baltimore Orioles take on the New York Yankees at a baseball game in Camden Yards, schedule permitting. AWMA has reserved a block of tickets in the Upper Reserve Level. One of the new unique events, "Pollution Prevention in Practice: How to Reduce Waste Generation and Make More Money," is a short two-part program on pollution prevention in the process industries developed jointly by AWMA and AIChE. Wednesday's tutorial, "The Practice of Pollution Prevention," describes a methodology to discover improvement opportunities in existing processes that result in waste reduction, energy conservation, reduced raw material usage and increased economic return to businesses. A "hands-on" case study will be used to illustrate the methodology. Thursday's session, "Case Studies in Pollution Prevention," will feature speakers from the process industries discussing waste reduction successes in a variety of process facilities. The 4th International Urban Environmental Infrastructure Forum, entitled "Critical Air Quality Issues Facing Developing Countries," intends to provide a highly interactive format to allow participants to openly discuss air quality strategies with decision-makers from around the world who have hands-on experience implementing and evaluating air quality control programs. AWMA full conference registrants can attend the Forum by checking off the box on the registration form and paying an additional fee. For more information, visit www.awma.org/ace2002. This article originally appeared in the June 2002 issue of Environmental Protection, Vol. 13, No. 6, p. 60.